The market turning to 40G/100G transmission is imperative in today’s gigabit Ethernet applications. MTP cabling assemblies, with their overwhelming advantages, provide a fast, simple and economical upgrade path from 10 Gigabit to 40 or 100 Gigabit applications. As we all know, 40G/100G gigabit Ethernet backbone networks often use 8-fibers per channel, which means most existing equipment doesn’t utilize fibers fully in 12-fiber cabling systems. Today this post will introduce a type of MTP fiber cable—MTP conversion cable which can overcome the problem mentioned above. 12-fiber MTP connectors are popular in the past years. And most backbone networks deploy the 12-fiber cabling systems. But with the quick development of optical transceivers, for 40G/100G gigabit applications, many transceivers that are guiding the industry from 10G to 40G and100G utilize only eight fibers. Then the problem arises. However, MTP conversion cable allows users to convert their existing MTP backbone cables to an MTP type which matches their active equipment. It’s a low-loss alternative to conversion modules because they eliminate one mated MTP pair across the link. There are mainly three types of MTP conversion cable on the market: 1×2, 1×3 and 2×3 MTP conversion cable. This MTP conversion cable has a 24-fiber MTP connector on one end and two 12-fiber MTP connectors on the other end. It is used to allow existing 10G MTP 12-fiber trunk cables to carry 40G/100G channels. The 40G/100G signal is split equally across two 12-fiber trunks which were previously installed within a traditional MTP modular network. 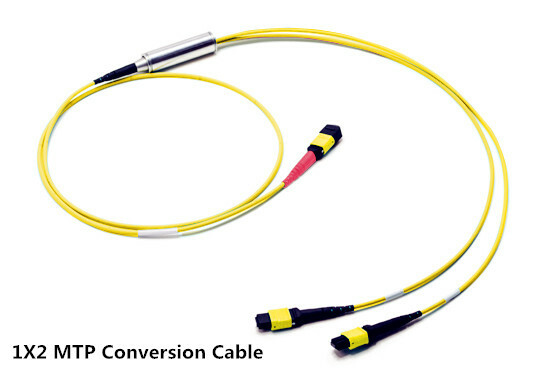 Like the 1×2 MTP conversion cable, this conversion cable also has a 24-fiber MTP connector on one end. But the other end comprises three 8-fiber MTP connectors, which is different from the former type. 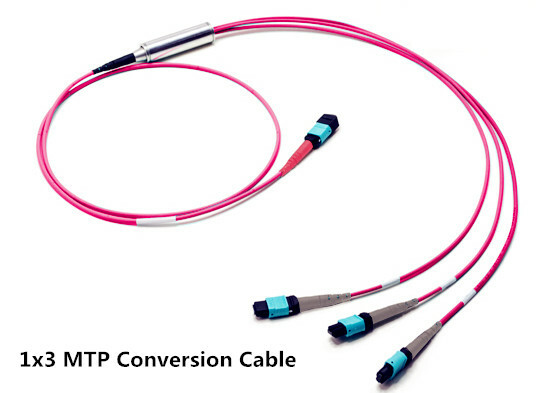 This MTP conversion cable allows users to convert their 24-fiber backbone trunks into Base-8 connections so that 40G rates can be achieved easily. A Single Base-24 connection is split out to three Base-8 connections, giving users three 40G ports. 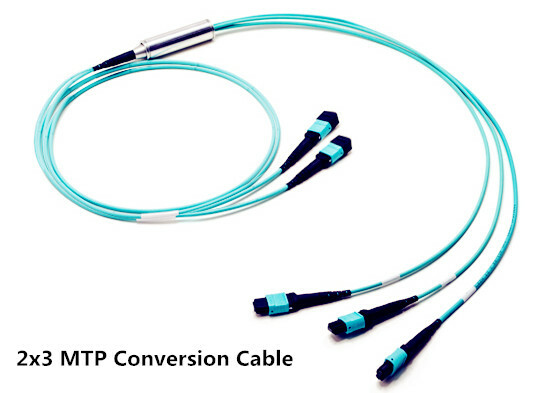 For users who have already installed a 10G MTP based network using 12-fiber and 24-fiber trunk cables and modules, this 2×3 MTP conversion cable can provide the conversion from 12-fiber to 8-fiber connectivity for full-fiber utilization, especially allowing for maximum use of existing fibers when converting to 40G channels. Because the conversion cable has two 12-fiber MTP connectors on one end and three 8-fiber MTP connectors on another end. They are available in either direct or crossed polarity for fast deployment using polarity management method A, and polarity can be reversed on site, offering enhanced flexibility & operability. The 40G/100G MTP conversion cables eliminate the wasted fibers in current 40 gigabit transmissions and upcoming 100 gigabit transmission. Compared to purchase and install separate conversion cassettes, using MTP conversion cables is a more cost-effective, lower-loss option. Here are three application examples. As shown in the picture below, two 40G/100G switches are connected by 1X3 MTP conversion cables (one 24-fiber MTP connector on one end and three 8-fiber MTP connectors on the other end), 24-fiber MTP trunk cable and MTP adapter panels. With this MTP conversion cable, less fiber cables are required. That brings more conveniences for cable management in data centers. The cabling solution for 40G/100G conversion with 1×2 MTP conversion cable is similar to the solution of 1×3 MTP conversion cable. In the following applications, connecting the 40G transceivers with a 8-fiber MTP conversion cable rather than a traditional 12-fiber MTP jumper, can enscure the 100% backbone fiber utilization and saving cost. The 40G/100G MTP conversion cables provide a cost-effective cabling solution for upgrading to 40G and 100G networks. All the benefits and features of these MTP conversion harness cables are explained in the article. And the three types of 40G/100G MTP conversion cable which are available in OS2, OM3 and OM4 options are provided in FS.COM. If you want to know more details, please contact us via sales@fs.com. This entry was posted in 10/40/100Gbps Networks, MTP MPO Cables and tagged 40G/100G gigabit Ethernet, 40G/100G MTP conversion cable, MTP fiber optic cable on February 10, 2017 by Chloe Wang. Nowadays, the existing bandwidth is not adequate to meet enterprises’ increasing appetite. In the meanwhile, optical technologies like cloud computing, virtualization and storage area networks are all in the fast development, which pushes the further development of higher-bandwidth tech like 40/100G Ethernet. Thus under this circumstance, new devices are greatly required. Besides the new optical transceivers and fiber optic cables, a steady proliferation of fiber connections—MPO (Multifiber Push-On) came into being. MPO cables, featured by its compact, pre-terminated advantages, has become the default cabling solution for the increasing bandwidth requirements. However, a flaw of the MPO cable may hinder its development. The testing process of the MPO cable can be complex and error-prone. Have you been through the scene? When you prepare to test a MPO cable, you have to throw polarity of all 12 fiber connections into the mix. And if it comes to migrating 10 Gbps to 40/100 Gbps on the same cable, all the testing job you have done is in vain. Since the testing process is pretty uneasy, The following text will provide some detailed information about it to help you do the right MPO cable testing. Typically, a MPO cable contains 12 optical fibers, and each fiber is thinner than human’s hair. So if you want to test the cable, you must test every fiber of it, which is quite difficult for inexperienced engineers. The common way to do this is to use a fan-out cord to make the 12 fibers separate, then testing. One fiber testing would take you 10 seconds. So if your customer ask you to test 48 MPO trunks cable in data center which has a 30,000-MPO data center installation, that means you need to spend 3,120 hours. Such a huge project! To avoid this expensive and time-consuming process, modular factory-terminated MPO cables promise simplicity, lower cost, and true plug-and-play fiber connectivity. Additional, when you are about to test a MPO cable, you should check whether the MPO cable is in the good state. Because cables must be transported, stored, and later bent and pulled during installation in the data center, which may lead to the performance uncertainties before fiber cables are deployed. Proper testing of pre-terminated cables after installation is the only way to guarantee performance in a live application. What’s more, fiber polarity is also an important factor you should take into account. The simple purpose of any polarity scheme is to provide a continuous connection from the link’s transmitter to the link’s receiver. For array connectors, TIA-568-C.0 defines three methods to accomplish this: Methods A, B and C. Deployment mistakes are common because these methods require a combination of patch cords with different polarity types. The market trend of telecom industry implies that 10G network has already been deployed in a large scale. And now 40G is main stream. As for 100G, people also already prepare for it. So bandwidth would always be a hot topic. We have said before that MPO cable can solve the problem of bandwidth. As data center bandwidth steadily climbs to 10, 40, and 100Gbps, a dense multi-fiber cable becomes the only option. That’s why the use of MPO cables has steadily risen over the past 10 years. With the MPO cabling system, 40/100G migration path seems to be a simple and easy solution. Just remove the 10Gbps cassette from the MPO cable and replace it with a bulkhead accommodating a 40Gbps connection. Later it might be possible to remove that bulkhead and do a direct MPO connection for 100 Gbps at a later date. Figure 2 shows a 40G connectivity with the use of the 12-fiber MPO cable. A 40G QSFP like QSFP-40G-SR4 connects to a 12-fiber MPO cable. 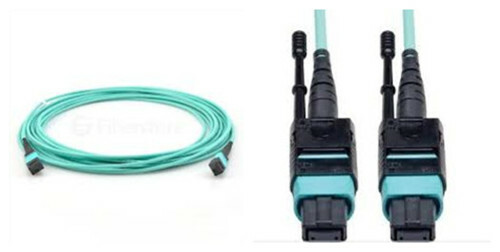 A 12-fiber MPO fanout cable is also used to connect four 10G SFP+ transceivers like 46C3447 with a MPO FAP. The problem is that while this migration strategy is an efficient way to leverage the existing cabling, in comparison to 10Gbps connections, the 40Gbps and 100Gbps standards call for different optical technology (parallel optics) and tighter loss parameters. In short, each time you migrate you need to verify the links to ensure the performance delivery the organization requires. When you move to this part, you may think that MPO testing may be a tough obstacle for us to conquer. So is there a simple way to do the testing? The answer is yes. You can just test all 12 fibers—the whole cable—simultaneously and comprehensively (including loss and polarity). That sort of test capability changes the fiber landscape, enabling installers and technicians to efficiently validate and troubleshoot fiber—flying through the process by tackling an entire 12-fiber cable trunk with the push of a button. To do a proper MPO cable testing, you must need some proper testing tools as shown in Figure 3. The tools to perform this type of test are emerging on the market, and promise to reduce the time and labor costs up to 95% over individual fiber tests. Characteristics to look for in such a tool include the following parts. An onboard MPO connector to eliminate the complexity and manual calculations associated with a fan-out cord. A single “Scan All” test function that delivers visual verification via an intuitive interface for all 12 MPO fibers in a connector. Built-in polarity verification for end-to-end connectivity of MPO trunk cables. “Select Individual Fiber” function that enables the user to troubleshoot a single fiber with more precision. The insatiable need for bandwidth ensures that the integrity of the data center, which has also become inextricably linked to the strength of the fiber cabling infrastructure. Now more and more MPO trunk cables are put into use, to make sure the better performance, you should be able to test the MPO connection. Fiberstore offers a variety of MPO products including MPO trunk cables, MPO harness cable, 12-fiber or 24-fiber MPO cable and so on. All of our products can also be customized. Please feel free to contact us. This entry was posted in MTP MPO Cables and tagged 10 Gbps, 100 Gbps, 12-fiber, 12-fiber MPO fanout cable, 24-fiber MPO cable, 40 Gbps, 40G QSFP+, MPO Cable, MPO harness cable, MPO trunks cable, Multifiber Push-On on April 6, 2016 by Angelina.Li. 40 Gigabit Ethernet is a standard that enables the transfer of Ethernet frames at speeds of up to 40 gigabits per second (Gbps), allowing 40 Gigabit Ethernet-enabled equipment to handle traffic at the aggregation and core layers. It satisfies the greater demands for faster data transmission and higher bandwidths. Thus, the business case for 40 Gigabit Ethernet is becoming inescapably compelling although 10 Gigabit Ethernet is still making its way into data center. A right and cost-effective solution for 40 Gigabit Ethernet is very necessary for all users who want to migrate to 40G. The picture above is the summary about 40 Gigabit Ethernet, explaining significantly that cables and transceivers are the basis of the whole solution. And actually, they are also the main cost of the item. Next some types of 40 Gigabit Ethernet cables and 40g qsfp transceiver will be introduced in details. The cable applied in 40 Gigabit Ethernet can be optical fiber or copper cable. The copper cable for 40 Gigabit Ethernet is designed for short reach, up to at least 7 m. As to optical cable, there are two types: singlemode cable and multimode cable. The transmission distance of multimode cable for 40 Gigabit Ethernet can be up to 150 m, which is much shorter than the transmission distance of singlemode cable (It can be up to 10 km). Generally, the common used types are OM3 and OM4 multimode cables in that its reach supports a wider range of deployment configurations compared to copper solutions, and the cost is lower compared to singlemode solutions. What is more, the MPO cable (Multi-Fiber Push On)/MTP (Multi-fiber Termination Push-on) cable is considered the best solution for 40GbE. It can connect the multimode transceivers to support the multifiber parallel optics channels. For 40 Gigabit Ethernet, we can use 8 fibers MPO/MTP harness cables or 12 fibers MPO/MTP trunk cables. The former is to directly connect a QSFP port to other 4 SFP+ ports. The latter is to directly connect one QSFP port to another QSFP port. Here is a picture to help you know it clearly. According to different standard form factors, 40g qsfp transceivers can be divided into different types, such as CFP transceiver, CXP transceiver and QSFP transceiver, ect. CFP transceiver, which has 12 transmit and 12 receive 10-Gbps lanes, can support one 100 Gigabit Ethernet port, or up to three 40 Gigabit Ethernet ports. This module is used for 40GBASE-SR4, 40GBASE-LR4. The former is based on 850nm technology and supports transmission over at least 100m OM3 parallel fibers and at least 150m OM4 parallel fibers, while the latter is based on 1310nm , coarse wave division multiplexing (CWDM) technology and supports transmission over at least 10km on singlemode fiber. CXP transceiver also has 12 transmit and 12 receive 10-Gbps lanes as well as CFP transceiver, supporting one 100 Gigabit Ethernet port or up to three 40G qsfp ports. Compared with CFP transceiver, the size of it is much smaller. And it is mainly designed for the high-density requirements of the data center, serving the needs of multimode optics and copper. QSFP transceiver provides four transmit and four receive lanes to support 40 Gigabit Ethernet applications for multimode fiber and copper today. The size of it is the same with CXP transceiver. It is mainly designed to support Serial Attached SCSI, 40G Ethernet, PCIe, 20G/40G Infiniband, and other communications standards. Fiberstore can offer customers 40 Gigabit Ethernet connectivity options for data center networking, enterprise core aggregation, and service provider transport applications. Since the products are all in good quality and low price, it may be the best choice for you to deploy the network. This entry was posted in Fiber Optic Cables, MTP MPO Cables, SFP Transceiver and tagged 40 Gigabit Ethernet, 40GBASE-LR4, 40GBASE-SR4, MTP/MPO cable, QSFP+ Transceiver on September 18, 2015 by Admin.